September 26, 2018 By Aileen 1 Comment This post contains affiliate links. As an Amazon Associate and member of other affiliate programs, I earn from qualifying purchases. 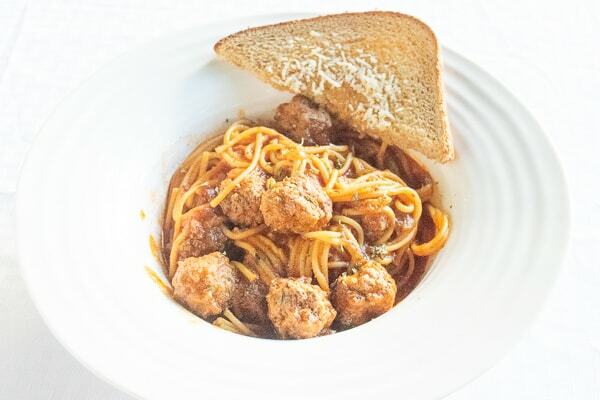 Are you looking for the best instant pot spaghetti and meatballs recipe? 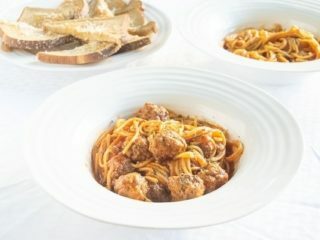 Look no further than this easy recipe that includes homemade meatballs! I love a good batch of spaghetti and meatballs. I have made them in my oven and slow cooker for many years. I knew it was time to add to my instant pot pasta recipes with an easy recipe for instant pot spaghetti and meatballs. Many recipes I see for pressure cooker spaghetti and meatballs call for frozen meatballs. I wanted to share how easy it is to make your own meatballs from scratch while still taking advantage of the time-saving abilities of the instant pot electric pressure cooker. Why make meatballs from scratch? I can control the ingredients and avoid unnecessary fillers and preservatives. I can customize it to my family’s tastes. If you like a spicier meatball, add some cayenne or crushed red pepper flakes. Want a leaner meatball? Use ground turkey. Want to switch to whole grains? You can use whole wheat bread crumbs. The options are endless. What if I don’t have time to make my own meatballs? First of all, if you don’t want to make your own meatballs, you don’t have to. Frozen meatballs are perfectly acceptable. You can also make a double or triple batch of meatballs and freeze them. Then, just toss them in frozen and cook them in the instant pot following the directions below. I discuss freezing meatballs in this post if you want detailed instructions. 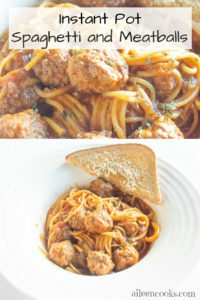 Are you looking for the best instant pot spaghetti and meatballs recipe? Look no further than this easy recipe that includes made-from-scratch meatballs! Combine the ground beef, breadcrumbs, milk, Worcestershire sauce, basil, parsley, garlic powder, salt, and pepper in a bowl. Mix together with clean hands until fully combined. Form into 1-inch meatballs and place at the bottom of the instant pot. Break the pound of spaghetti noodles in half and arrange on top of the meatballs. Pour the spaghetti sauce over the noodles and top with the 3 cups of water. Close the lid on your instant pot and set to sealing. Cook on high pressure for 5 minutes. Do a controlled quick release - letting the steam out in quick little bursts. If the sauce is to thin, set the instant pot to saute and let the sauce cook down for 3-5 minutes. 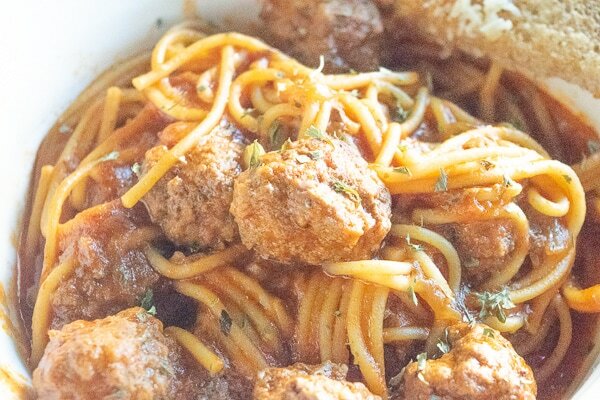 Serve instant pot spaghetti and meatballs immediately and refrigerate any leftovers. 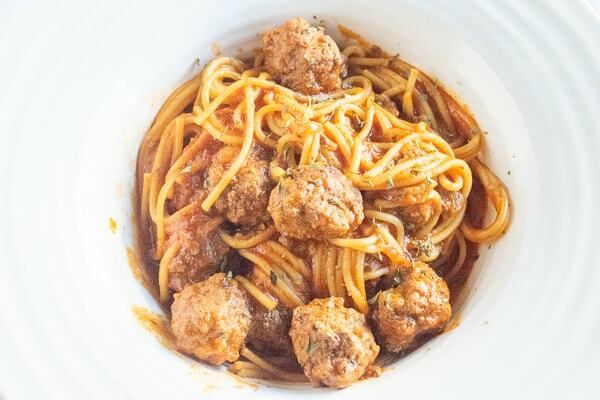 We love a big bowl of past and this recipe for instant pot spaghetti and meatballs is my new go-to for busy weeknights. Yummy and super easy! My noodles we’re a little too soft because I got sidetracked with laundry, but that’s my fault. It was still great and we all ate too much!